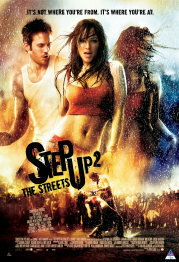 The kinda-followup to ''Step Up'' is set in the same place, but with a different cast. A young woman, a member of a dancing street gang, gains admission to the elite dance academy. This proves to be too much for her old friends, who kick her out of their dance team. She decides to build a new crew, using a convenient hunk at her new school, and other new schoolfriends. Their aim is to win the underground ''The Streets'' dance competition. Violence One scene of implied violence disturbs. Comments Some menace and threat in a couple of scenes could scare younger unaccompanied viewers.